The group dives deep into Volume 2 as Walter rediscovers parts of the story he'd forgotten about. The latest developments in Gigantomakhia are also discussed as the miniseries nears its climax in Issue 3. Over in Video Game chat: Steam Sales, Game of the Year?, Final Fantasy 8 (what? ), Zelda Spirit Tracks (what? ); and in movies: The Hobbit and The Thing prequel. I had to bail out around the 3/4 mark of the Berserk chat, but Griff and Aaz carried it through to the end. Hope you guys enjoy it! 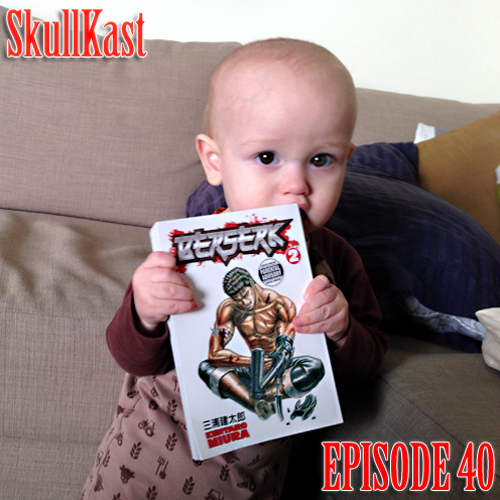 Pictured is my son, who is eating my Volume 2, which was left out while I was re-reading it for the show. He's showing Guts how teeth should be used. A very satisfying podcast to top off the end of the year! Although I consider myself an especially big fan of volumes 1-3, it's comforting to know that I haven't been able to catch everything. A very satisfying podcast to top off the end of the year! Although I consider myself an especially big fan of volumes 1-3, it's comforting to know that I haven't been able to catch everything. Really? What in particular was new to you? Those schmucks are nothing without you! NOTHING! Nah it was all good. I hadn't really thought about the parallels between Vargas and Guts's loss in terms of their families. Since Guts didn't even realize that Casca was pregnant, it opens up a new dimension of how Guts potentially viewed what could have been during his "dark period." Miura missed a great chance to draw that and rack up the sad points! Cool podcast guys and a happy new year to you all. Couldn't help myself but listen to the Gigantomakhia part twice though I still need to pick up the last YA issue. I recently got back my Berserk volumes 27 though 34 and have been re-reading those. Plan on getting to 1, 2 and 3 by the weekend ... and with your insight on those volumes thus far, it'll make for good reading. Also good to hear Griffith talk about Carpenter's The Thing vs the prequel. I thought the prequel was as good as a movie you'd see on SyFy and embarrassing for the franchise. The events in the prequel chronologically mirror Carpenter's version, tries too hard to be like it. The new alien was not as terrifying (what did it want to do in this one?) and the CG looked bad (like that blue thingie that looked like Lego blocks inside the ship ... oh dear), the old movie did a good job of creating suspense around the situation of who is the replica vs who's human, amazing soundtrack on the old one. The prequel isn't horrific, comes off as a generic movie. Maybe they figured by getting a female lead they could try and make the movie look badass like the Alien franchise? It's also a bit inconsistent - the block of ice in Carpenter's version looked like a cube cut with some sort of different machinery with vertical grooves around the box, the prequel has just a smoothly cut block of ice. The man shown sitting on a chair who cut his wrist and throat looked different in both versions. Can't argue about the burnt specimen found with two heads. Different Norge helicopters in the end? Maybe they figured by getting a female lead they could try and make the movie look badass like the Alien franchise? I think that's a pretty sexist notion. I am loving the re-reads of each graphic novel, even though I recently read through Berserk from beginning to present, I feel like I've missed a lot of these details that you guys brought up. I know you probably wont do it for every volume, but I hope you can continue to do more past three. Also, cute baby pic Walter! Happy (late) new year everyone. I am loving the re-reads of each graphic novel, even though I recently read through Berserk from beginning to present, I feel like I've missed a lot of these details that you guys brought up. Thanks! You'll probably really enjoy the reread of Volume 3 then. We just finished recording it; editing it now, and I think it went really well. I know you probably wont do it for every volume, but I hope you can continue to do more past three. We talked about it a little today. I think we agreed to continue in sequence with the volumes, at least until we (I) burn out on them.